(1) How many fight in overlap? (2) What can the pikes do when it's their turn? Can they turn 90 degrees to face (and fight) the enemy? Do they have to conform in some way? So in this case you'd get 1 dice as you only have 1 base in contact. 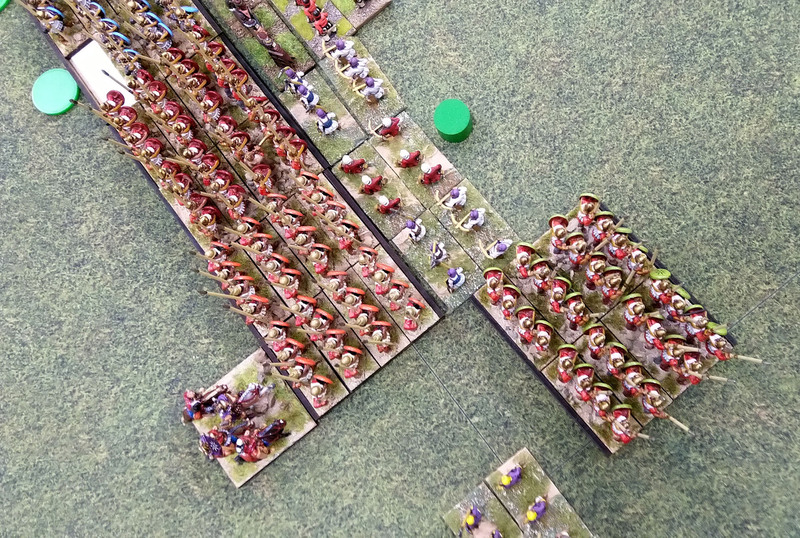 You course being pike, they would have to move 3" to contract, meaning g they can't. The other option is to turn 180, which would give two dice on a 4 rather than one dice on a five. Are you sure Phil? Page 48 - "move normally in the manoeuvre phase" would seem to allow this. Page 76 says one of the options for a BG in side edge to side edge contact with an enemy BG is "turn 90 degrees to face it". However the posters on this thread seem to agree the Pikes can not turn 90 degrees to initiate melee combat. What am I missing? A battle group in side-edge to side-ege contact with an enemy battle group can turn 90 degrees to face it, "
So as the battle group is eligible to provide an overlap it can't turn 90 degrees. Oddly enough, Dave is correct. That's not odd. It's normal.